With a history thought to date to Roman times, Tilbury has long been a center of politics, travel and trade. In 1588, Queen Elizabeth I came ashore on official army-related business, and in 1852, an Act of Parliament initiated the construction of the Tilbury Docks. Four years later, the docks welcomed their first vessel, making Tilbury the main port for London. Indeed, Tilbury is part of the wider Port of London, with the great city itself just 25 miles away. You might take in Tilbury sights such as the Tilbury Fort, originally built by Henry VIII, and the Tilbury Docks, used as a location for the films Indiana Jones and the Last Crusade and Batman Begins, before heading off to explore London. Legendary landmarks, including Westminster Abbey, Big Ben, Parliament Square, Whitehall, the Tower of London and the fashionable West End will prove exceedingly fascinating, whether this is your first trip or a long-anticipated reprise. Bergen, "Capital of the Fjordland" and Norway's second-largest city, was founded in 1070 AD. In its heyday, Norwegian Kings resided here. It was the largest city in Norway and there were no less than 27 churches and abbeys. Bergen is an immaculate city, set between the mountains and the sea, where traditional values hold firm over transitory ways. The local people take great pride in the rich heritage of this, one of Norway's premier cities. After gliding serenely into majestic Aurlandsfjord, the ship will berth in the tiny village of Flåm. Boasting dramatic nature and a serene atmosphere, Flåm is situated in the innermost part of the Sognefjord and surrounded by breathtaking mountains. From this tranquil area, dwarfed by towering mountain peaks, one of the world's most remarkably engineered railway lines originates and winds its way far above the sea. The 13-mile train journey provides views of some of Norway's wildest and most magnificent scenery. The twisting tunnels that spiral in and out of the mountain are manifestations of the most daring and skillful engineering in Norwegian railway history. Rivers cut through deep ravines, waterfalls cascade down the side of steep, snow-capped mountains and farms cling dizzily to the sheer slopes of cliffs. At the foot of the mountains, you can enjoy the natural beauty of the Flåm Valley and admire the majestic Aurlandfjord, a branch of the world's longest fjord, the Sognefjord. Pronounced “aw,— Å means “small stream— in Old Norse, a single-letter title that suggests a long maritime history. 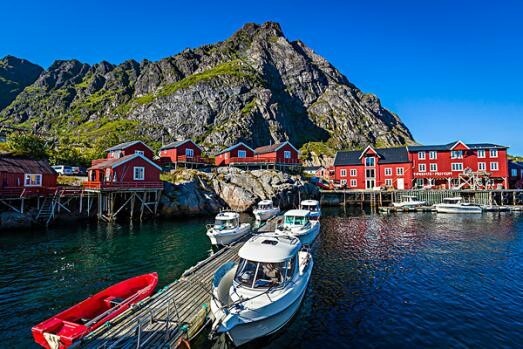 The name also prompts some confusion: At least seven villages in Norway are called Å, which is why “i Lofoten,— or “in Lofoten,— is added for clarity. To visit “aw— is to inspire the other kind of “awe,— with chances to head out to sea to watch for whales, venture to nearby reefs to observe the largest number of nesting birds in Norway, or gaze at majestic peaks and quaint villages with a bike ride or hike. To honor the islands’ traditions in fishing, you might bait and cast a line or, if you prefer, savor Lofoten’s famous stockfish at a local eatery. You might also learn about the seafaring way of life at the Lofoten Stockfish Museum and Norwegian Fishing Village Museum. Situated above the Arctic Circle in the central part of the Lofoten archipelago, Gravdal boasts breathtaking scenery, highlighted by glacier-carved mountains and indigo waters embracing colorful wooden buildings typical of Norway. Especially dramatic against the hard, blue sky is the red wooden tower of the Buksnes Church. Built in 1905 in a Dragestil design, the church showcases an architectural style popular in Scandinavia in the early 20th century characterized by steep roofs, large eaves and Norse motifs such as serpents and dragons. While mystical creatures like these appear only in inanimate, decorative form, real-life animals such as whales, sea eagles and seals can be seen with jaunts by kayak, bike, boat or foot. Tromsø, the capital of Troms province is known as "the capital of the Arctic." It lies on a forest-covered island in a narrow waterway, hemmed in by steep mountains and connected to the mainland by a bridge. This city has long been renowned as an important center of science and exploration. The imaginative Arctic Cathedral, the Polaria Centre and a scenic cable car ride are among the varied attractions Tromsø offers to its visitors. 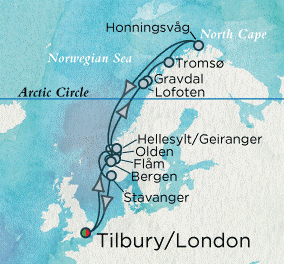 In the early afternoon your Crystal ship docks at the peaceful town of Honningsvåg set on Mageroy or "Meager" Island. Fishing is the dominant industry for the island's 3,500 inhabitants. Honningsvåg is your gateway to the North Cape plateau, Europe's northernmost promontory, with its infinite views over the vast expanse of the Artic Ocean. Olden and the surrounding area is an artful juxtaposition of charm and natural majesty. From a historic 18th-century church and a variety of small shops and cafes in Olden, to the south lies Briksdalsbreen, an amazingly blue glacier whose impressive beauty is fair reward for a hike along a picturesque winding path affording glimpses of picture-postcard vignettes of waterfalls, rivers and mountains. For centuries, Stavanger and its surrounding areas have played a leading part in Norway's maritime history - from the time when Viking kings battled in Hafrsfjord, through the period of the "White Sails," steamships and modern super tankers. As a result of its prime geographical location, Stavanger is considered the most important oil city in Norway.